I've got my hands on the Galaxy S9! I've been waiting for this moment for so long. At the moment our story together is only one day long, but I'll tell you my first impressions after 24 hours with the new Samsung Galaxy S9. Here's our first date, from the moment I took it out of its box to the initial tests of the camera and super slow motion features and AR emojis. Samsung Galaxy S9 vs S9+: Which to choose? Samsung Galaxy S9 camera review: What's the verdict? At about 10 o'clock on Monday morning, a small package arrived from Samsung. It was none other than a Galaxy S9 and S9+ fresh from the factory. Shortly after, the sleek S9 box fell into my hands. 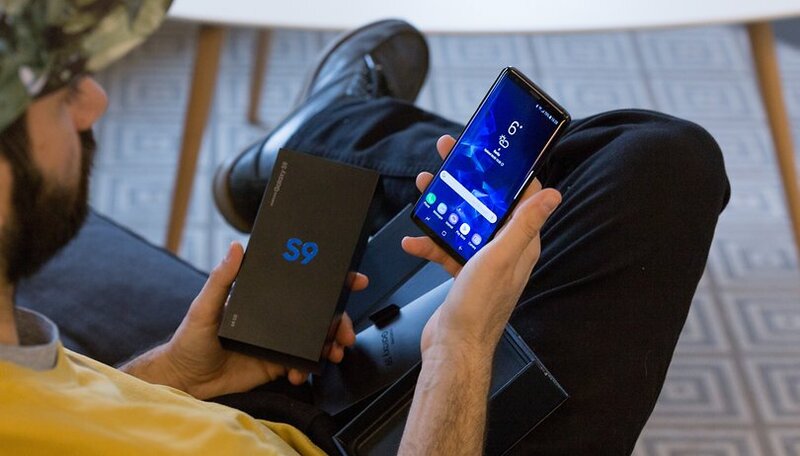 Looking straight at it, I could read "S9" in a metallic blue on a black background that reminds me a bit of leather. Then I thought: "It's the same box as the S8". This was the first déjà vu of many, as being reminded of this device's predecessor is unavoidable. When I opened the box, there was the S9 in the same place as the S8 was just months ago. The plastic smell was what I first noticed. Although the experience improved drastically after picking the device up. The sleek feel reminded me of the S8 once again. Turning it around gave me a sense of relief: "Finally, Samsung, the fingerprint sensor is where it should be." In the first ten minutes of using with the device, I accidentally pressed the Bixby button 2 times. My colleague Luca Zaninello did it 4 times in just the first 5 minutes. Your mileage may vary. In any case, this is something that also happened with the S8. Among the main new features are the camera-related ones such as: noise reduction, Super Slow Motion and AR emojis. And these functions are just the ones I've been playing with the most. The night photos of the S7 were already fabulous, but with the S8 and now with the S9 they've been improved even more. Specifically, the S9 incorporates a new technology to reduce noise in night shots, that's impressive from the first photo. During MWC, my colleague Steffen Herget was able to take some snaps on the streets of Barcelona at night, and he reported great results, so I couldn't wait to try it our for myself. When you can compare the reality that your eyes see with the photos that the S9 takes at night, you realize its true power. The results are very bright, and it even makes normal nighttime seem like the last light of a sunset. This gives a slightly false lighting to the photo, but lets you see and preserve details imperceptible to the human eye. And the truly incredible thing is the reduction of noise. White colors in the middle of the night are almost without noise. The background of the dark sky is without those messy colorful spots everywhere. In short, it produces very homogeneous colors while other smartphones color your photos with noise. The Super Slow Motion function we had already seen in the Sony Xperia XZ Premium with its Motion Eye camera. The Samsung camera also with this video feature with 960 fps and a resolution of 1,280 x 720 px. The only new thing that Samsung introduces is automatic shooting. In automatic mode, you can set a square in the middle of the image that detects when something enters it and automatically triggers the camera to capture at 960 fps for about 0.2 seconds. My first 20 attempts were total trash. After a little practice, you realize that you need a certain frame to correctly detect the movement. It also needs a lot of light so it's not very useful at night. The automatic capture function can also work several times during the same video, you just have to wait for the buffer to be empty so it can fire again. The results can be very impressive. Samsung's AR emoji have been criticized for being a kind of copy of Apple's Animoji. Personally, I think they are a technological innovation that we could all do without. But, I admit it's been a good laugh playing around with the personalized avatars with my friends. As far as likenesses go, mine doesn't quite hit the mark. Apparently my beard is too complicated, and the S9 doesn't like it, because it doesn't even show up on my little digital alter ego. I didn't expect much from the battery, but after a day, I'm willing to give it the benefit of the doubt. At about noon, I charged up the battery to 100% and then spent the rest of the afternoon fiddling with the camera, trying the new features, taking night photos, using maximum resolution, playing games until late, and it still managed to last until 8 AM. The display used 30% of the battery in just under 4 and a half hours. It left a very good impression, which I hope will last through the final review. What will happen on my next date with the S9? We'll have to wait and see. When it does not sell well enough for Samsung there will be incentives. Not happening with the S8 so far. Its actually around the same price as the S8, suprisingly. Really? It's cheaper than the S8 and people did just fine.